So, what do you do when the stress gets to you? Here are some quick, short-term solutions to get you through those moments of intense stress. 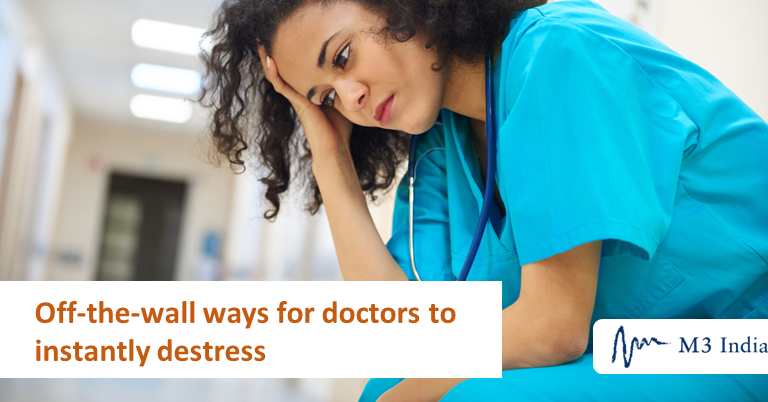 Physicians are stressed. Everybody knows it. So, what are the recommended ways to destress? Practice yoga. Meditate. Eat right. Get regular sleep. Exercise… The list goes on. But even if you’re a supreme master of meditation or you’re eating a strict Mediterranean diet, you can still become stressed in the heat of the moment. We smile when we’re happy—but does forcing a smile also force you to be happy? Apparently, it does. Researchers found that even a forced smile can lower heart rate and improve positive emotions during and after stressful events. Individuals who smiled with their mouth but also with their eyes (a “smize,” or “smizing,” as it’s informally called, or a Duchenne smile as it’s formally called) got the greatest physiological and psychological benefits. When babies are stressed, they automatically know what to do: They scream and cry. “But I am not a baby,” you say. “I don’t scream and cry and throw a tantrum when something goes wrong.” Of course not—but then again, maybe screaming off some steam wouldn’t hurt. At many colleges, for example, students gather to let out a primal scream during stressful times, like finals week. Similarly, researchers have shown that cursing helps to manage pain. So, the next time you feel like you’re ready to explode, find a solitary place—your car, perhaps—and scream and curse your head off. It really f***ing works! Washing the dishes, when performed as a mindfulness exercise, can be a stress-reliever. (If the term “mindfulness exercise” turns you off, then just think of it as “shutting everything out” in order to focus exclusively on the task at hand.) In one small study, researchers found that mindful dishwashers (who focused on smelling the soap, the temperature of the water, and the number of dishes) significantly reduced nervousness by 27% and increased feelings of inspiration by 25% compared with dishwashers who weren’t mindful. “It is interesting to note that a task potentially construed as unpleasant or a ‘chore’ can be experienced as reducing nervousness and being inspirational by simply shifting one’s approach to the task and quality of attention,” the researchers wrote. Pets put people at ease. Researchers have shown that simply owning a pet significantly lowers owners’ blood pressure and heart rate during times of mental stress. In a small study, healthcare providers who spent as little as 5 minutes interacting with a dog reduced their serum and salivary cortisol levels—physiological indicators of stress. So, if you work in a hospital that has a therapy dog and find yourself in a stressful situation, go track down that dog and pet it as much as you can. If you don’t have a dog nearby to destress you, try watching some cat videos on YouTube. In one notable study (yes, this was an actual study), researchers found that people who watched internet videos of cats felt a significant increase in positive emotions (such as hope, happiness, and contentment), a significant decrease in negative emotions (including anxiety, annoyance, sadness, and guilt), and significantly higher energy levels than before watching the videos. Don’t believe it? Just try watching this video and see if you don’t feel better! This story is contributed by John Murphy and is a part of our Global Content Initiative, where we feature selected stories from our Global network which we believe would be most useful and informative to our doctor members.